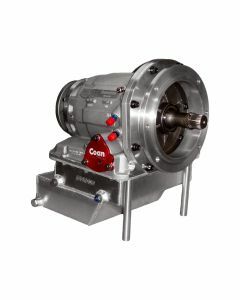 The Powershift XMT marine two-speed transmission was designed and manufactured by Coan Engineering in conjunction with renowned marine engine builder Keith Eickert. Rigging and testing for the project was provided by Don Onken and Sons from Lightning Performance Group, utilizing their 32’ Skater. The driving concept for the project was to develop a transmission which provided a low range with gear reduction to help propel today’s large catamaran poker run boats on plane faster while also maintaining a direct drive range for top speed. Shifting may be performed manually or electronically under FULL POWER providing un-matched acceleration. Low speed harbor maneuvering and docking is also made easy with the prop speed reduction offered by low range of the Powershift XMT.